1951 is a little outside our usual time frame, but as we at Radio Days are now reading and researching around the London pleasure gardens and their saloon theatres out of which, in the early middle years of the 19th century, emerged what we now recognise as ‘music hall’, I could not resist posting this snapshot (right; click to enlarge) of the table of contents of the official guide book, followed below by a gem of a 8mm amateur film I found this morning that captures the essence of the Festival of Britain Pleasure Gardens at Battersea Park. 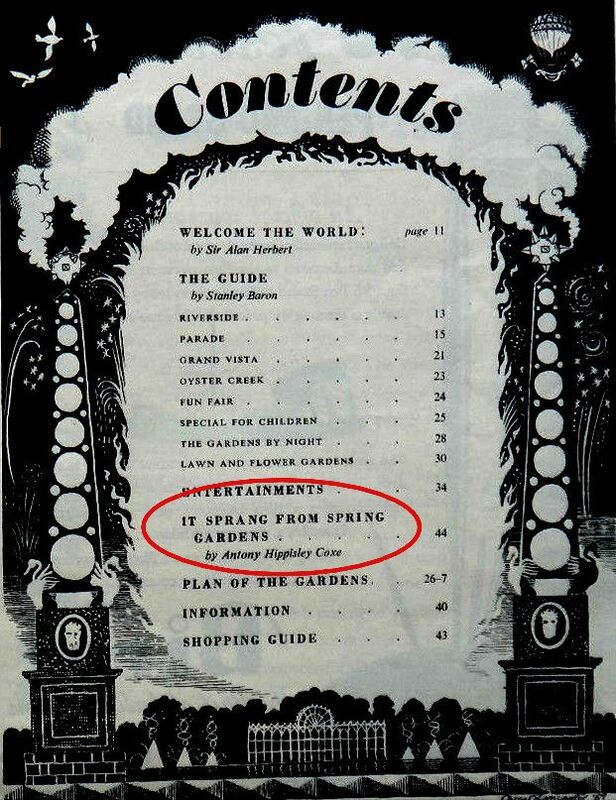 Note the item I’ve ringed in red on the Contents page: just as the Festival of Britain overall marked the centenary of the 1851 Great Exhibition, so the Pleasure Gardens explicitly evoke the Spring Gardens at Vauxhall (circa 1660-1859), the largest in London. ⟵Whatever happened to Catherine Crick?